When a book lover talks about their passion, smell often comes up. 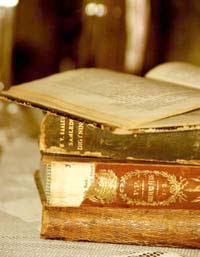 Old books have a distinct smell, which is surprising given the wide variety of materials and binding techniques used over the past few hundred years, and especially in the time-range most book collectors have. Rag paper, wood pulp, natural glues, synthetic glues, animal fibers, leather, burlap, all sorts of inks — I'm tempted to claim the smell is the combined layer of finger oils on each page, but that'd be getting gross. That ongoing change in materials and progressive smell-inducing decomposition has given an idea to researchers: A new test has been developed to determine a book's age by it's smell (full abstract here). This measures the kinds of organic compounds that an aging book is giving off, and determines its age by comparing to the known components of books. It's a much better process than the destructive tests, requiring parts be cut out of the book for analysis. As you might guess, if they can test for the 'volatile organic compounds' that a book emits, then they know what those are, right? Well, those compounds must be useful for something - and here comes the science: you can now buy that book-smell in a convenient spray-can. It seems kinda hoaxey, but, people, the science is there: book apologists have long claimed the smells involved in reading are a reason to avoid eBook readers, but if technology has overcome that obstacle, there's no stopping them. Well, nothing other than a product recall.